How do some young animals know what to do and how to do it? Does someone teach a caterpillar what to eat? Who gives a baby shark swimming lessons? 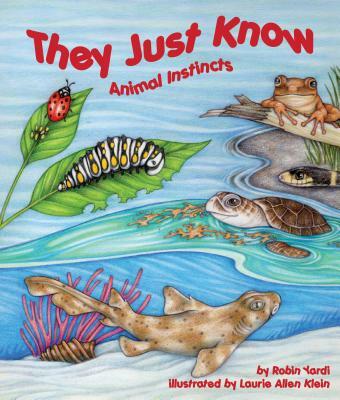 Sometimes young animals learn things from their parents, but other times... they just know Explore animal instincts through engaging text and fanciful illustrations. Laurie Allen Klein has been a freelance artist for nearly 25 years. Over the last several years, she has worked as the on-staff artist for a marine park, where she does everything from painting life-size sea animal murals to illustrating children's activity books. In addition to Saving Kate's Flowers, They Just Know, Laurie has illustrated The Ghost of Donley Farm, Fur and Feathers, Where Should Turtle Be?, Little Skink's Tail, Solar System Forecast, Meet the Planets, If a Dolphin Were a Fish and Balloon Trees for Arbordale. She was the winner of the Outstanding Pennsylvania Author/Illustrator Award from the Pennsylvania School Librarians Association in 2008 and is a member of the Society of Children's Book Writers and Illustrators. Laurie lives in Florida. See more of her artwork at lauriekleinarts.com.